Meeting Management Training Materials are designed for trainers to teach employees and management the art of making meetings work! Confidently train your staff and management the basics for effective meetings, keys to productivity, how to lead a meeting and more! 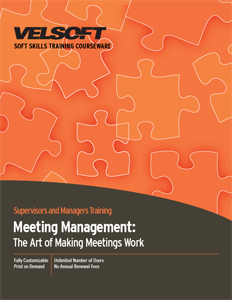 Seeing is Believing This sample manual to teach Meeting Management is in MS Word format. This customizable classroom training material package is all about writing a business plan. We've included two days of material on gathering, analyzing, and presenting information that shows how and why your business is going to be successful. Everything you need to deliver an engaging course is included in this course on writing a business plan. We've included an instructor's guide, student materials, marketing materials, and it's all customizable! We also offer this course as eLearning for students on the go.